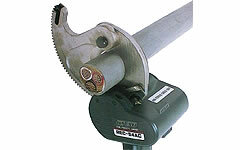 REC-54AC Battery Operated Tools: Izumi Products. The REC-54AC was specifically designed for cutting the toughest copper and aluminium cables in a limited amount of space. Cuts are clean with a minimal amount of cable distortion. Repetitive ratcheting movement is entirely eliminated. Just a squeeze of the rocker trigger is all it takes to cut your toughest copper cable. It is a heavy duty cable cutter for non-ferrous cables up to 54 mm O.D.. A powerful gear reduction motor pulls a movable blade through the toughest copper cable. It is equipped with a circuit breaker for overloading protection. Hard copper cable 150mm2 (21mm OD) 150/300 cuts.